​Through an extensive trunk show, Linda shares her concept on how to "Rock" a block. Change a color, rotate a patch, or perhaps divide a patch and you have a whole new "flavor" for the block. Sometimes combining several rocked blocks give you suprise secondary or terciary patterns - depending on the colors used! 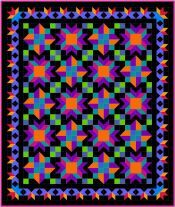 This very dynamic looking quilt uses Linda's newest concept for quick and easy piecing. Students will learn how to create variations of the Weathervane quilt block with a simple change of color or turning one of the pieces!Combine these blocks with a complex looking (but easy to piece) border and voila! - you have an awesome looking quilt! Learn Lindas ONE PIN technique for making perfect New York Beauty blocks on your first attempt! The blocks are combined to create lilypads as the background design. 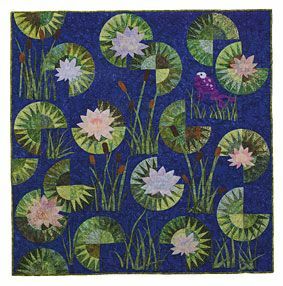 Fused and raw edge appliqued waterlilies and cat tails complete your pond! You can choose whether or not to add the frog. Class kit contains re-useable paper piecing stencil, custom acrylic templates, foundation paper 9that can be left in the quilt) and the patterns for the flowers and frogs. BONUS - the kit will also contain an additional paper piecing stencil for an optional border and pattern for letters to make the small door banner - Welcome to Our Pad! !